When you have a dino-obsessed daughter in the house, you look for ways to entertain her. You buy dino books and stuffed animals. You take her to the American Museum of Natural History for a look at dinosaur fossils. You watch her glee as she watches Dinosaur Train and Dino Dan, and you have to admit, it's kind of infectious. You find yourself learning a thing or two about Pteranodons and the Triassic Period. And then you hit the jack pot. You hear about something so cool, so Jurassic Park without the scary parts, that you race to your nearest New Jersey Transit train to see it. I'm talking about Field Station: Dinosaurs, of course. 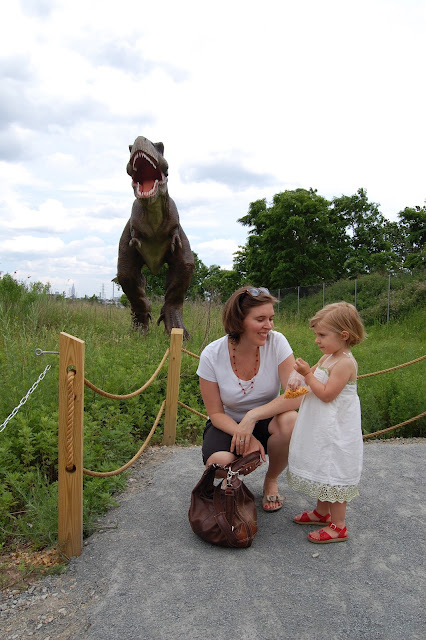 Thanks to the lovely ladies at Mama Drama, I was able to bring my family to check out this truly one-of-a-kind dino experience which is a only 1 stop out of Manhattan in Secaucus, New Jersey (once off the train, we walked the 10 minutes to entrance, but there are free shuttles available on the weekends). In a surprisingly rural and country-like setting (the Meadowlands), we first got our "passport" tickets stamped and headed off on our dino adventure. As we walked the path, we met moving animatronic dinosaurs that are VERY realistic-looking. Not only do they move their heads around but they also "growl" (or whatever you call dinosaur speak). I thought for sure that my dino dahlin' would be scared, but that only happened once with a Velociraptor, and even then it was short-lived. In between dinosaurs, there are camp sites where you can stop off and take part in activities like digging for fossils, bird-watching or "Raptor Feud," a game show with questions about (you guessed it) dinosaurs and archeology. These educational activities are a fun way to break up the dino tour and keep you wondering about what's around the next corner. There is a limited menu of food and beverages available for purchase, but I liked the fact that you can bring in your own lunch and sit under a covered area with picnic tables. We took a break here before we headed out to meet a few more prehistoric creatures, and it was nice to get out of the sun for a bit. Sufficed to say, it was a fun day out at Field Station: Dinosaurs. If you have a dino-lovin' kiddo at home, I highly recommend this quick and easy trip out of the city. Here's a video of my gal meeting a T-Rex for the first time. In a way, it was like she was seeing an old friend that she'd been missing. June 24th is Hudson County Day at the Field Station! There will be special discounts for Hudson County residents and special dinosaur crafts to take part in. Disclosure: My family and I were provided with complimentary tickets to check out Field Station: Dinosaurs. All opinions expressed herein are my own. No way. That is SO cool! What kid wouldn't love that? I think even I would love that! I'd take the kids there often if I were you.